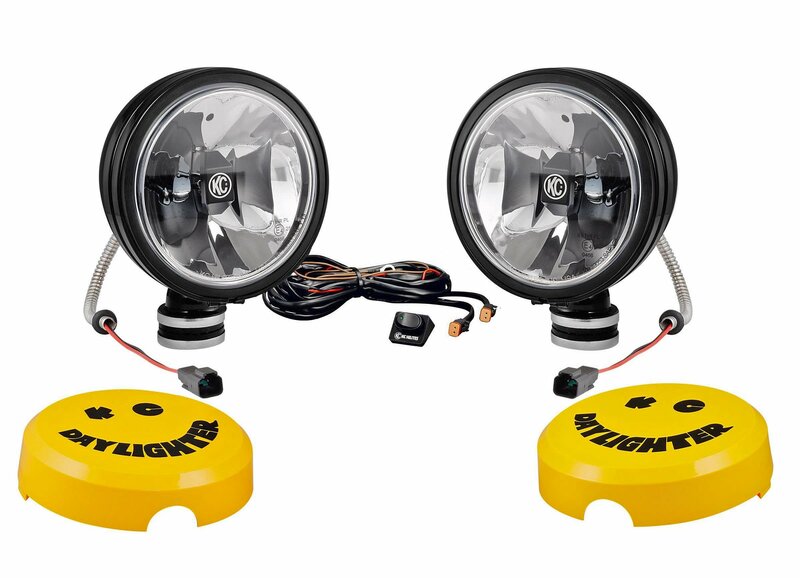 KC HiLiTES all new 6 LED Daylighter® Systems are a performance off road LED light in an all metal housing. Pair Pack System comes with two 6 Gravity LED lights (20W each, 40W Total), switch kit and wire harness. Features KCs patented Gravity Reflective Diode (GRD) Technology for a more controlled and farther reaching light beam pattern, two Powerful Cree XML2-T6 10w LEDs  20w total per unit, rugged and durable, with a hard coated polycarbonate lens. Daylighter® lights include a competition-proven flexible base for easy and accurate aiming along with protective and stylish ABS stone guards. Very nice retro look for jk. Easy mounting with kc windshield brackets. Wired to sPOD. I was disappointed they came with those ugly yellow lens covers especially at the overall cost. I ordered kc black rock guards but did not realize they were sold individually versus pair so had to order another one.